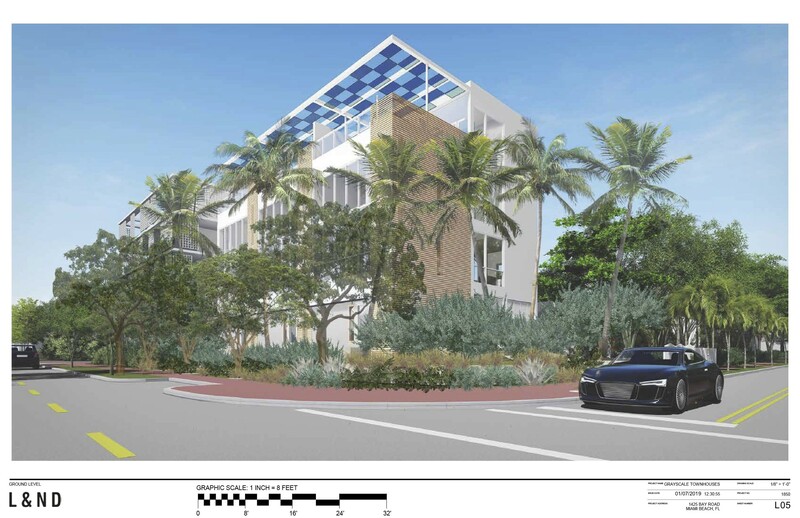 Plans have been filed with the Miami Beach Design Review Board for a development of three, four-story townhomes on a vacant lot at 1425 Bay Road. The project is proposed for the maximum 7,440 feet of allowable FAR (floor area ratio or density) on the site. According to the application, the project “complies with all setbacks, lot coverage, landscaping and height requirements.” There are six parking spaces proposed that “are hidden in the center of the property on the ground floor, concealed from both adjoining streets,” according to the filing. The applicants, Bay West 1, LLC, are requesting one variance to waive 3’ 6” of the minimum required 22’ interior drive aisle in order to accommodate 6 spaces. Bay West 1, LLC is owned by Grayscale Partners of Coconut Grove. Its partners are listed as Nathalie Manzano and Theodore Caplow. “The landscaping plan includes terraces and a small communal garden,” the applicants write. 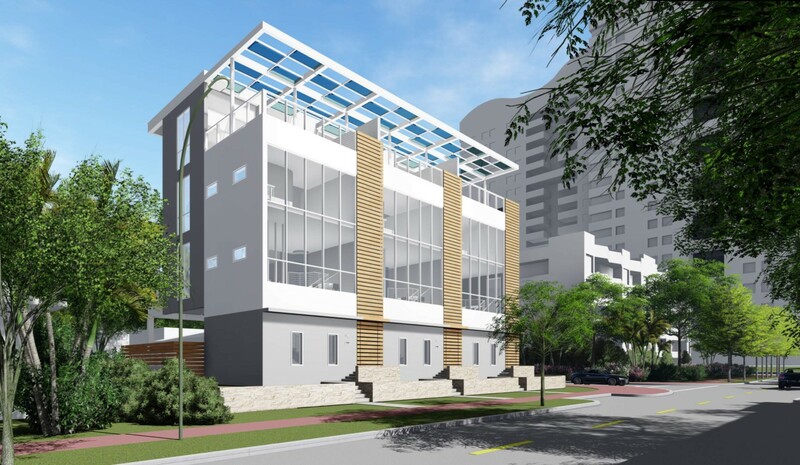 “We intend this project to be the first residential building in Miami to achieve both LEED (gold or platinum) and WELL building certifications (the latter is an emerging international standard intended to enhance occupant health in building design and operation). 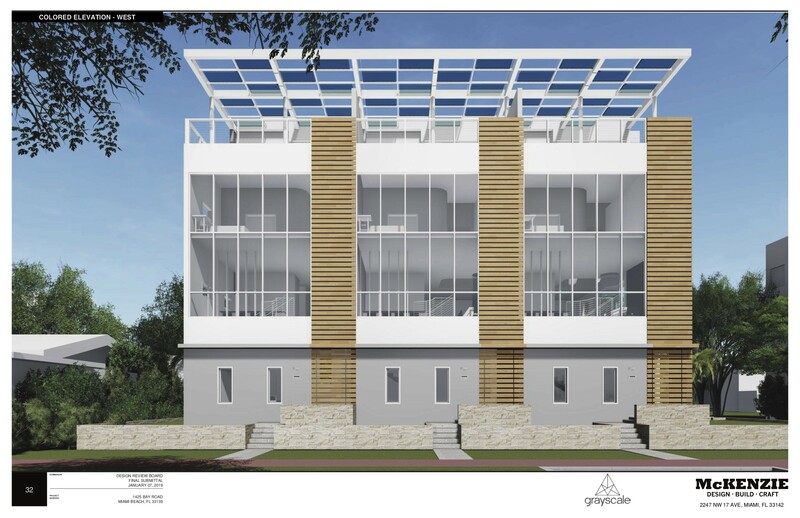 The building will include three identical rooftop solar arrays, one for each unit, designed to partially shelter a rooftop terrace, while remaining inconspicuous from the sidewalk adjacent to the building. Other green and healthy features include resilient landscaping relying on local plants, a rainwater retention system for irrigation, abundant daylighting, superb insulation and energy efficiency, nontoxic materials throughout, and automated ventilation systems, among many others,” according to the filing. 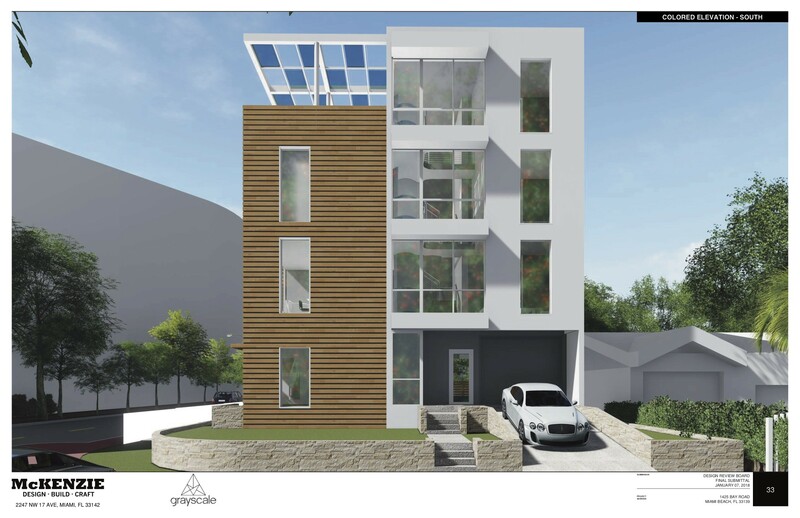 “The style is contemporary but quiet and minimal, emphasizing natural materials, a light palette, and an approachable feel that relates positively to the existing design themes within our community (art deco, modernism, and tropical),” the application states. “At four floors the Project’s scale and massing represent a modest midpoint bridging the single family homes to the east and the very large complexes (Flamingo, Sails, Waverly) to the west and south. Other projects recently built or under development along the east side of this stretch of Bay Road present similar or larger massing,” the applicants say. The proposed project is across the street from the Flamingo Park apartment complex, across 14th Terrace from The Sails Condominium building, and behind a single-family home. According to the application documents, the lot to the north of the proposed project has received DRB approval for a five-story, eight-unit residential building. 1425 Bay Road is within the area proposed by developer Todd Glaser as a “city of the future.” His vision for the area – tentatively dubbed West of West (WoW) district – would include resilient residences and greenspace along with art galleries, cafés and community spaces. Glaser is meeting with the community to generate support for a rezoning to allow commercial uses in the area. All the details on the project can be found here.